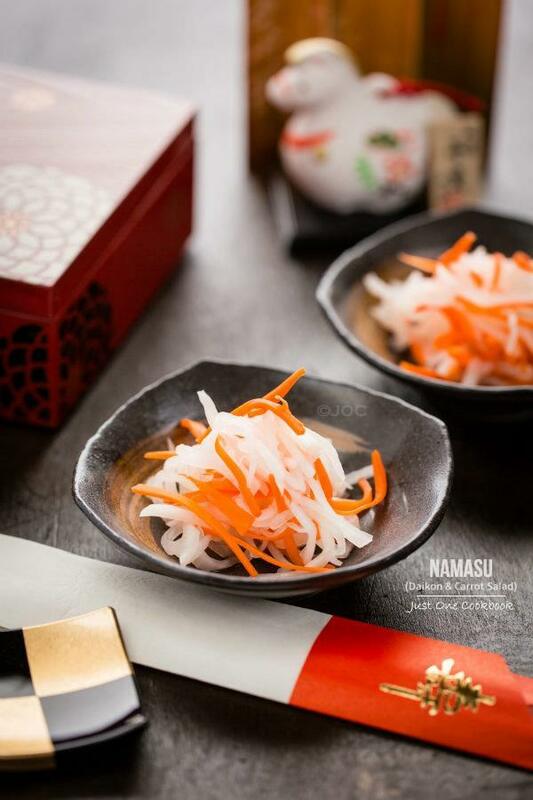 Thinly sliced daikon and carrot strip pickled in a sweet vinegar sauce, Namasu is a refreshing salad commonly served as a Japanese New Year’s dish. You’d love its bright and just slightly sharp flavor! 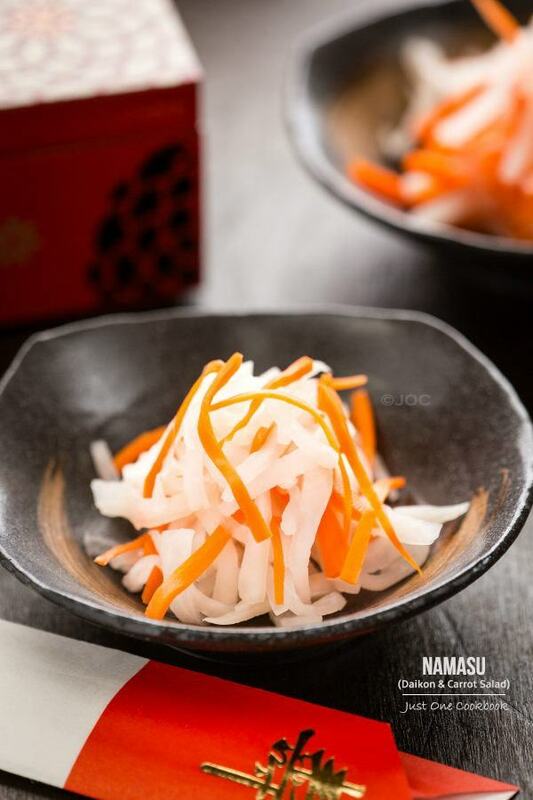 Namasu (紅白なます) is a daikon and carrot salad lightly pickled in sweetened vinegar. 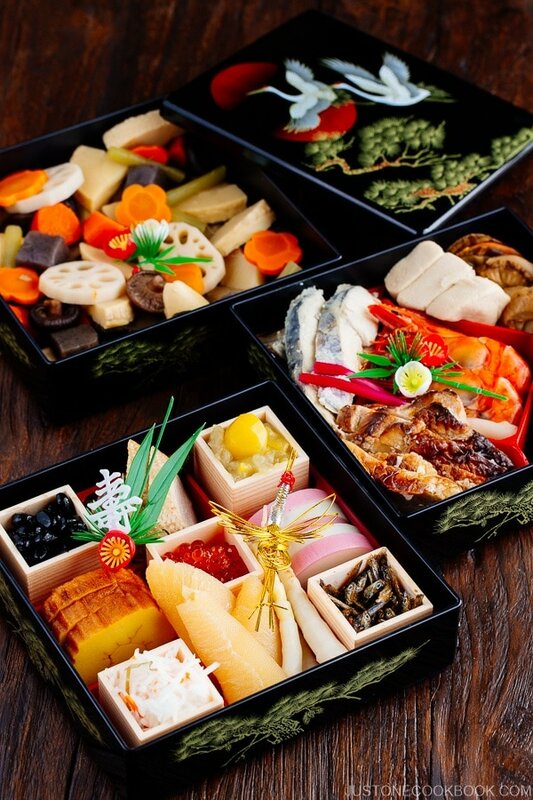 This dish was introduced to Japan from China around 700s (Nara period) and it is especially enjoyed during the New Year in Japan. Red and white are considered celebratory colors in Japan and these colors are often used in many traditional ceremonies. 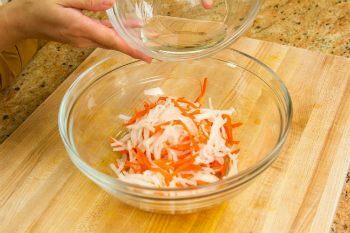 Thinly sliced daikon and carrot strip pickled in a sweet vinegar sauce. 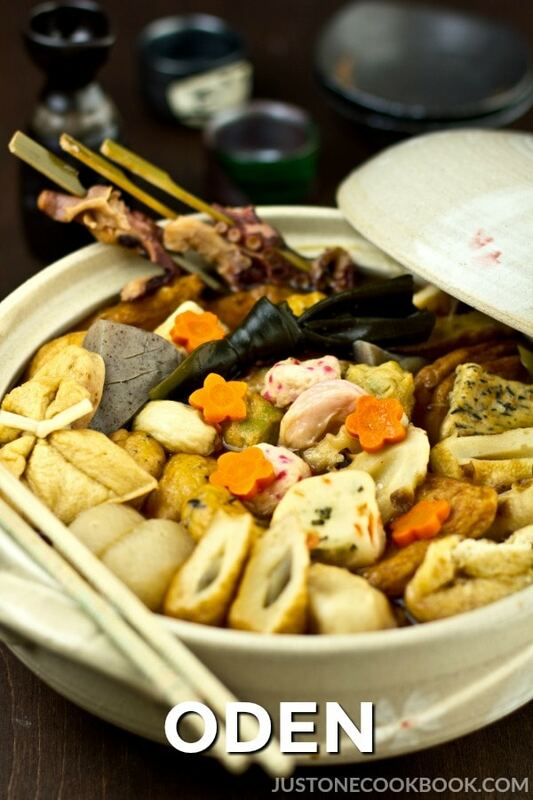 Typically served as a Japanese New Years dish. 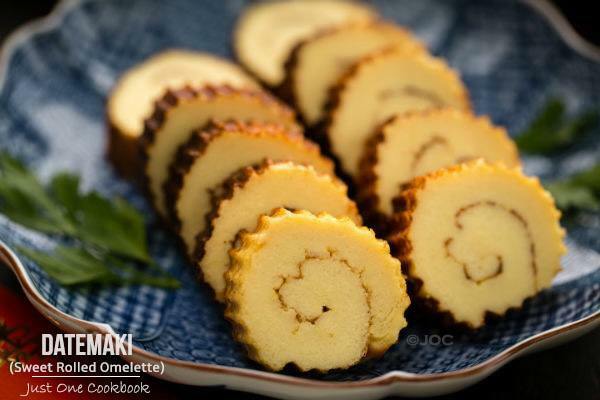 Namasu is extremely easy to make and can be prepared ahead of time. If you like lightly pickled salad, you will enjoy this dish as an appetizer or as a side to your main dishes. In Japan, this dish is also called Kohaku (red & white) Namasu. Besides daikon and carrot, you can also include cucumbers for another layer of color and crunch. The key to this dish is to make sure to squeeze out all the liquid from the veggie, it creates optimal crunchiness. To pickle, you only need sugar, salt, water and rice vinegar. In Japan, there are usually a few strips of yuzu zest added on top of the salad, but I had to leave it out since I couldn’t find fresh yuzu locally. Yuzu strips add amazing citrus fragrance to the dish. For those lucky ones who can access to fresh yuzu in your area, you’d definitely want to include it in this salad. Crunchy, slightly sharp with a bright refreshing taste, Namasu (daikon and carrot salad) is also one of the first salads I’d make when root vegetables are in season. 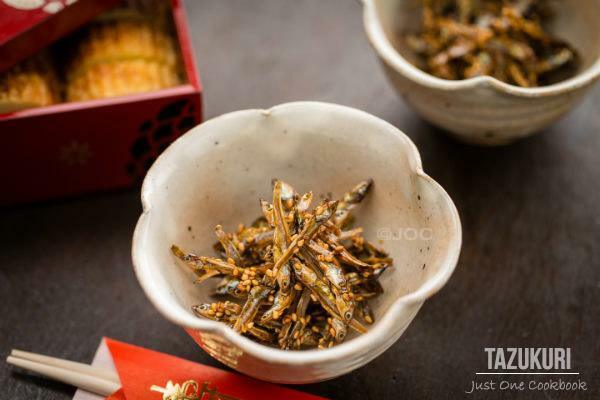 It goes very well with fish or any grilled meat. 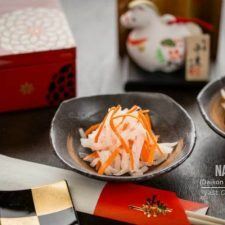 If you’re serving namasu for your Osechi Ryori (New Year’s food), don’t forget to check out the other popular dishes which I shared here. 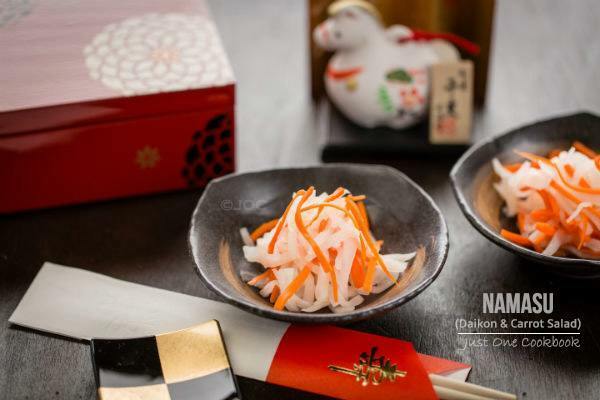 Thinly sliced daikon and carrot strip pickled in a sweet vinegar sauce, Namasu is a refreshing salad commonly served as a Japanese New Year's dish. You'd love its bright and just slightly sharp flavor! 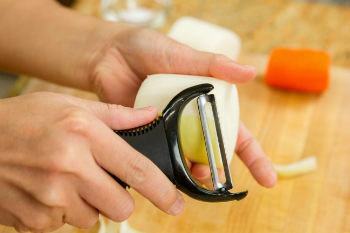 Peel the daikon and carrot. Thinly slice the daikon and carrot lengthwise into 1/8-inch-thick slabs (3 mm thickness). Stack a few slabs at a time and cut lengthwise into 1/8-inch-thick strips. Meanwhile combine all the ingredients for the seasonings in a small bowl and whisk well together. 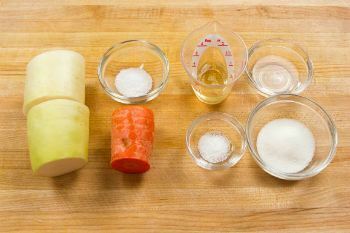 Squeeze water out of daikon and carrot and put in a new bowl. Pour the seasonings and mix well togther. 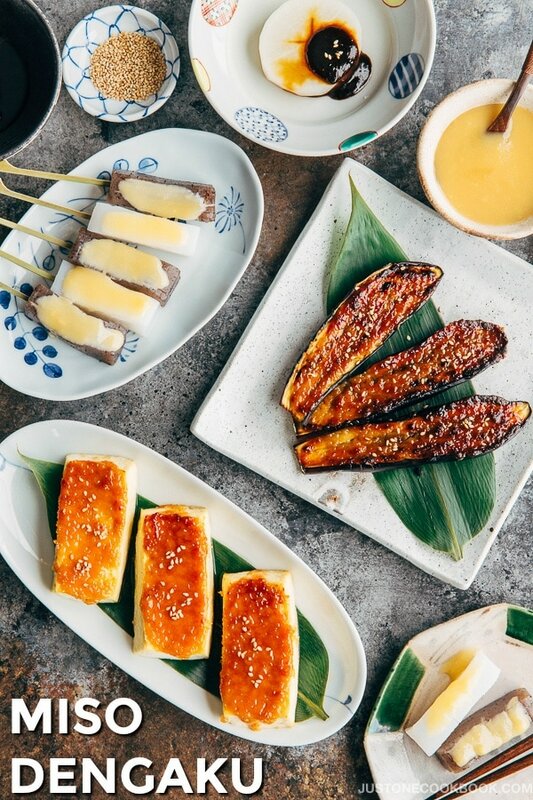 Garnish with thin strips of yuzu and serve at room temperature or chilled. The ratio of carrot to daikon should be 1 to 5. I really must give daikon radish a try in the new year and this salad seems nice and simple. It’s quite refreshing to see such a light and simple little salad with all of the holiday type recipes coming out right now. And with all of the cookie platters from neighbors this weekend, I sure could use a light salad like this. I love this! I hope you and your family have a wonderful holiday season!!!! Hi Nami! Happy holidays to you and your family! I love this salad and make it quite often, I wish I could try it with the yuzu though. Looks beautiful in your photos. Hope you have a great holiday and a very happy and prosperous New Year. G’day Nami! Love anything with daikon, true! Your salad is very healthy, versatile and YUM too! A healthy and delicious salad! Namasu is my favorite vegetable side dish and I make it often with Japanese cucumbers, too! Wishing you and your family a very Merry Christmas, Nami! Looks really delicious and it gives me apetite just now! Thank you so much Helena! Happy New Year to you and your family! I hadn’t known that this dish was so easy! Thanks for sharing the recipe, and I can’t wait to try this out for New Year’s — I absolutely love the sweet and vinegar-y taste. =) I hope that you and your family have a warm and wonderful Christmas! Hi Kimmi! Yes it’s so easy! I’m glad to hear you have tried this dish before. Thank you for being a wonderful reader Kimmi! Happy New Year to you! Hi Nami, lovely simple side or salad to counter all the rich food of the season. This is such a nice, light salad! Very refreshing – I need this about now! Thanks, and I hope you and your family have a wonderful holiday. this sounds like a great salad, very light and flavorful 🙂 Happy Holidays from me to you and your family. This is a lovely salad which I enjoy to give the tummy a break too after too much food, like a bit of a palate cleanser. Happy holidays to you and your family! My dear friend, Nami! Happy Holidays to you! 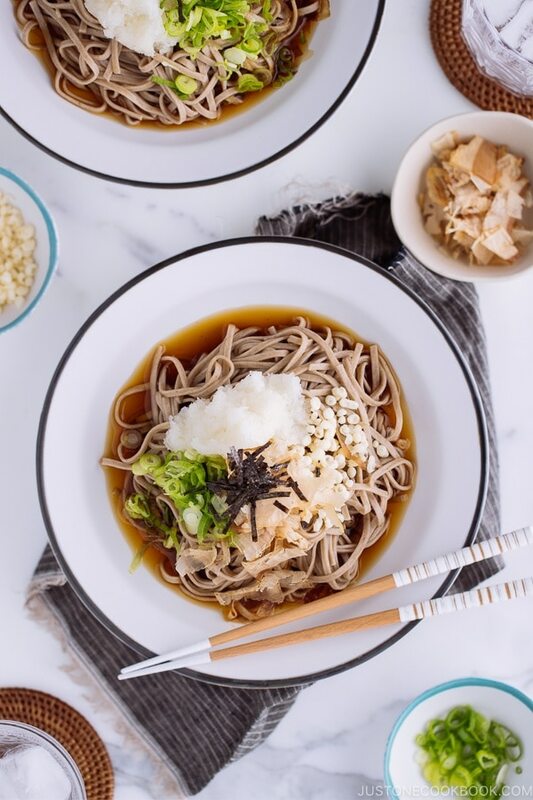 I always enjoy your posts so much – love your recipes and learning more about Japan and Japanese culture! Keep it up girl! Everything about your recipes are so carefully displayed with the beautiful bowls and color combinations that I cannot wait to buy your book, but until then the e-book will be great so I can look back on these well crafted recipes that you have shared with us. Thank you so much… looking forward to 2014. Seasons Greeting !!!! Hi Laura! Thank you for your kind message. 🙂 I’m so happy to hear you enjoy my blog and thank you so much for following my blog! Happy New Year to you and your family! I like to put namasu in my ban-mi sandwich . It totally works! I had this salad in a restaurant long ago and loved it. I’m glad you’re sharing the recipe here 🙂 …. Happy New Year to you and your family Nami, and may this new year brings you happiness and joy. It’s a simple recipe yet it will bring out the flavor of the main dish that you serve this with. Happy New Year to you and your family Nami! Nami, I hope you had a spectacular Christmas with your sweet family! Your salad looks terrific…and you do such an amazing job with your step by step photos! wow, one of my fave…. Merry christmas and happy holidays Nami, God blessed you all the way!!! Nami, your salad sounds light and refreshing in a sea of indulgent treats this time of year. (I like your “ratio” note, too — thanks for that.) Wishing you a joyous New Year! Love this simple and refreshing appetiser. Wishing you a Happy New Year! And a wonderful 2014 ahead! This is so cool! In Vietnamese cuisine, we eat something very similar! We add it in fish sauce and eat it with many Vietnamese dishes! This would be so refreshing with a spicy meal. Your knife skills are fantastic Nami and I hope you’re enjoying the holiday season. Thanks for all the wonderful recipes and tutorials you shared this year. So simple but so beautiful! Carrots go really well with daikon and actually I have made a Japanese dish today adding carrots to usual daikon… the experiment was quite successful! I will bear your salad in mind. I love namasu, they are very tasty in rice, salad or even sandwiches. Daikon is one of my favorites, too, love them in brothy soups! Hope you and your family had a fabulous holidays and here to a happy, healthy and loving 2014! May I know how do you make the daikon and the carrot soft ? It looked soft in the picture. Hi Kat! By pickling it it. The carrot and daikon will be still crunchy but become more flexible texture. We had this with the ginger rice and salmon. It was delicious and so refreshing. I’m wondering why water is added to the dressing if we salt the vegetables to get rid of the water. And also it seems like it was 2 to 1 ratio daikon to carrot from the pictures and measurements, but the note says 5:1. If I double the recipe to keep in the fridge will it lose crispness? It’s so pretty. Salt to the vegetables is not only used for withdrawing water but also making it more wilted. Water to the mixture is to dilute the vinegar so it is not too strong.